A study commissioned by the Latvian Ministry of Economics was conducted in August and September of 2007 to find out what businesspeople in Latvia think about the effects which administrative procedures have on the country�s business environment, focusing also on the issue of electronic governance. A total of 720 businesspeople were surveyed by SIA Aksedo. This paper focuses on the most interesting results. 85.1% of Latvia�s businesspeople use the Internet at work. The likelihood that this is so is largely based on the size of the enterprise � 81.6% of managers of micro companies, 94.3% of managers of small companies, and absolutely all managers of medium and large businesses use the Net. The lowest percentage was found in the region of Kurzeme (63.9%) and the region of Latgale (70.7%). Internet use among businesses has increased over the last two years � 62.5% of respondents reported using the Net for work purposes in 2005, which was 19.9% fewer than was the case this year. 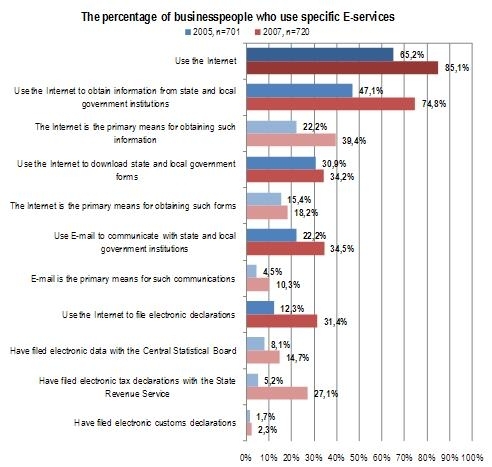 � 34.2% of businesspeople use the Internet to download state and local government forms. Two years ago, 30.9% did so. For 18.5% of businesspeople, that is the main way of receiving such forms (15.4% two years previously). � The percentage of businesspeople who use E-mail to ask state or local government institutions for information about laws and regulations or to handle administrative procedures has increased from 22.2% to 34.5% in the last two years, while the percentage of entrepreneurs for whom E-mail is the main form of communications with state and local government institutions has more than doubled, from 4.5% to 10.3%. � The most rapid increase in the last two years has been in the percentage of businesspeople who have filed electronic documents via the Internet. In 2005, only 12.3% of respondents had sent documents to such institutions as the State Revenue Service, the Central Statistical Board, etc., but this year 31.4% had done so. � 27.1% of businesspeople this year sent their tax declarations to the State Revenue Service in electronic form � more than five times more than the 5.2% who had done so in 2005. � 14.7% of businesspeople filed data with the Central Statistical Board in electronic form in 2007 � 6.6% more than in 2005 (8.1%). � The percentage of those businesspeople who have filed electronic customs declarations has increased a bit � 2.3% in 2007, as opposed to 1.7% in 2005. The percentage of businesspeople who use E-mail to communicate with state and local government institutions has increased quickly over the last two years, and there have also been improvements in terms of how state and local government employees respond to such E-mails. In 2007, 75.2% of businesspeople reported having received an answer to the last E-mail that they had sent (67.9% in 2005). 14.6% had not received a response � 4.9% fewer than in 2005 (19.5%). The amount of time needed to receive a response has declined over the last few years � it took an average of 4.5 days to receive a response in 2005, while in 2007 the average was 3.1 days. The longest period of time between the sending of an E-mail and the receipt of a response declined from 40 days in 2005 to 21 days in 2007. One-third of respondents reported having received an answer to their last E-mail in just one day (26.5% in 2005). 32.1% had to wait for two or three days (35.5%), while 6.6% both in 2007 and in 2005 reported having to wait for four to six days. 13.7% of respondents in 2007 and 18.4% in 2005 reported having to wait at least seven days for a response to their E-mail. Asked whether use of the Internet to obtain information or forms from state and local government institutions is at an acceptable level, 38.4% say that yes, it is, but certain improvements are still needed, 31.7% are completely satisfied with the process, and 11.4% say that for the time being, the level of quality remains unacceptable. Respondents also said that the situation with receiving information and forms from state and local government institutions on the Internet has improved over the last two years. The percentage who feel that these opportunities are adequate has increased by 14.2% since 2005, the percentage of those who as partly satisfied has risen by 15.8%, while the percentage of those who are not satisfied at all has remained more or less unchanged. Businesspeople are less positive about E-mail communications with state and local government institutions � 27.3% consider these to be adequate, 24.7% agree, but feel that improvements are needed, and 12.5% say that the opportunities are inadequate. Since 2005, the proportion of those who feel that E-mail communications with state and local government institutions are inadequate has dropped by 1.8%, while the proportion of those fully satisfied and partly satisfied has increased by 12.3% and 8.5% respectively. 24.5% of businesspeople are satisfied with how they can submit E-documents to state and local government institutions, 25.7% feel that there should be improvements in the process, and 10.8% consider the opportunities to be inadequate. The percentage of fully and partly satisfied respondents has increased by 13.7% and 10.5% respectively over the last two years, while the percentage who feel that opportunities file electronic documents are inadequate has declined by 4%. The results show that the desire of businesspeople to file various kinds of documents electronically has increased substantially over the last two years. This year more than one-half of businesspeople said that they would like to file electronic tax declarations with the State Revenue Service, as opposed to just 18% who were ready to do so in 2005. Nearly one-third (30.3%) of businesspeople would like to file electronic data with the Central Statistical Board (6.5% in 2005). 21.3% of businesspeople would like to submit their annual reports electronically. 11.6% would like to file different kinds of reports and requests to the Company Register in electronic form, and 5.5% would like to file requests with the State Land Service in that way. Just 2% of respondents talked about electronic requests for licences, permits and approvals, and 0.7% talked about submitting public procurement documents, including bids, in electronic form. 2.3% of businesspeople said that they would like to file absolutely all documents to state and local government institutions in electronic reform, while 21% of respondents did not want to do so at all, either because they felt no need for it or did not believe that they can do so. 91.7% of respondents in the 2007 survey were aware of the fact that E-signature services are available in Latvia, but only 9.9% were actually using such services. Managers from larger companies were more likely than others to use the E-signature � 8.7% of directors of micro companies, 12.1% of managers of small companies, 17.4% of bosses of medium companies, and 25.1% of directors of large companies. The E-signature is used more often by businesspeople running companies with foreign capital (15%), and it is least often used in the region of Kurzeme (just 6.9%). The low rate at which the E-signature is used in Latvia can largely be explained through the fact that there is comparatively little information among businesspeople about the service and the advantages which it affords. More than one-half (57.2%) of those businesspeople who were not using the E-signature said that they see no purpose to it. 15.2% of such businesspeople said that they do not have sufficient opportunities to do so, while 13.6% said that they haven�t used the E-signature because the don�t have enough information about it. 6.8% of respondents said that the E-signature is too complicated, and that�s why they don�t use it. Another 6.2% said that they don�t trust the E-signature because they are afraid about the security of the relevant data. 4.0% of respondents thought that the E-signature is too expensive and thus not of economic advantage. Users of the electronic signature are, generally speaking, satisfied with the opportunities and convenience of the service. Satisfaction with the opportunities was reported by 57.8% of respondents. 24.2% said that they were mostly satisfied, while 11.5% reported being mostly or completely dissatisfied. 98.1% of respondents were partly or fully satisfied with the convenience of using the E-signature, while only 1.9% were not. In 2005, businesspeople said that their main source of information about state and local government procedures was the mass media (newspapers, radio and TV). This was reported by 62.3% of respondents, with Internet sources the second most often cited source of information (41.3%). This year, however, the Internet was cited by the largest percentage of businesspeople � 66.8%, or 25.5% more than in 2005. 53.1% cited newspapers, radio and TV. Other sources of information were cited by fewer than 20% of respondents. 17% said that they get information from friends and acquaintances (33.8% in 2005). The homepage of the Cabinet of Ministers is accessed by 16.8% of respondents (21.4%). 16.7% of respondents obtain information from the official government newspaper Latvijas V�stnesis (16.7%, as opposed to 27.3% in 2005). 10% get information about state and local government procedures from professional consultants. In 2005, that percentage was 31.5%, which suggests that information has become more readily available. Fewer than 10% of respondents cited sources of information such as compendiums of laws (7.5%), phone calls, letters or E-mails (7.4%), the Normative Acts Information System or sectoral associations (3.3%). Fewer respondents use such sources of information now than was the case two years earlier. Of all respondents 6.1% said that they have no interest in state or local government procedures at all and therefore do not search for such information. In 2005, that was claimed by 2.4% of respondents. Nearly one-half of respondents (46.7%) feel that information about state and local government procedures that is of interest to them is easily available. Asked about those areas in which there is a lack of information, 13.4% of businesspeople feel that information about state aid is difficult to find. Other areas of information in which there are such problems include tax administration (8.5%), private-public partnerships (7.5%), licences and permits (7.1%), the European Union (6.5%), real estate and construction (5.7%), inspectorates (5.5%), public procurement (5.5%), foreign trade (4.4%), labour relations (3.4%), electronic governance (3.1%), environmental requirements (2.3%), administrative courts (2.2%), and registration of companies (1.8%).